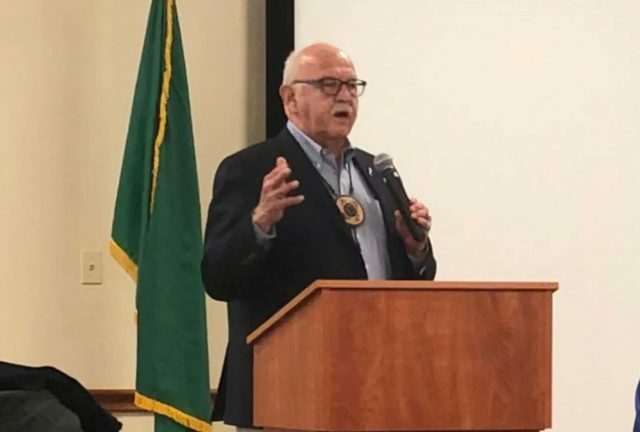 SEQUIM – Jamestown S’Klallam leader Ron Allen revealed the design of the planned hotel on Tuesday at the Sequim Dungeness Valley Chamber luncheon. The groundbreaking for the 100-room, $40 million hotel is set for February 4, and the Tribe hopes to open business in the Spring of 2020. Allen says the expansion, which will be adjacent to their 7 Cedars Casino in Blyn, is designed to attract out-of-towners that won’t come to gamble if there aren’t on-site accommodations. Allen says the hotel is only Phase 1 of a 3-part project. Phases 2 and 3 will eventually include 200 additional hotel rooms, and a conference center, extra parking and other traffic infrastructure.